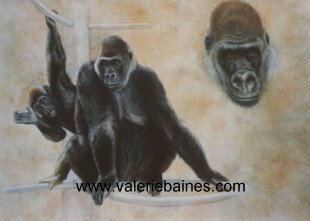 Seven of fourteen gorilla portraits for John Aspinall, some on show at Port Lympne, Kent. 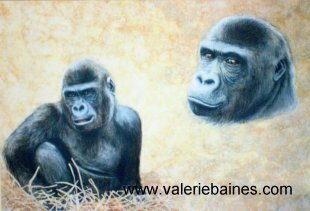 One of the most unusual and interesting commissions that I have had was to paint portraits of gorillas for John Aspinall. 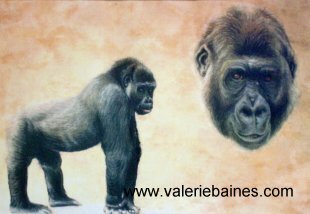 They are built differently from any other animals, so I began by studying the skeleton and muscles. 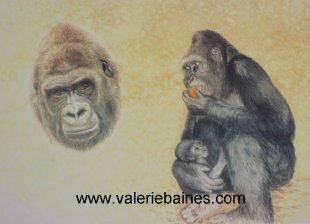 I was surprised by the variety of expression and personalities that were evident on closer acquaintance. Djoum, male. Very much the patriarch and on his dignity. Having come to watch me drawing once, he completely ignored me after that. Kibobo, male. He has rather a philosophical expression I think. 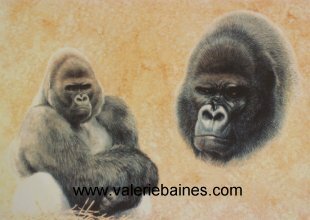 The only male gorilla that the females will allow to handle the babies. Bamenda, female. Born at Jersey zoo. Hand reared. Bitam, male. 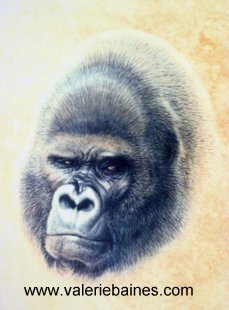 Though the soul of good nature, he is the only adult male the keepers do not go in with as he has never learned to tone down his play . 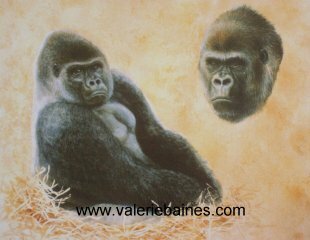 John Aspinall told me that the gorillas use only one tenth of their strength when reacting with humans. Jomie, male. Djoum's first offspring. Notice the lack of a "crest" which comes with age. It is a bony ridge across the top of the skull to which the muscles of the jaw are anchored. 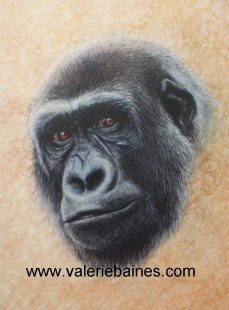 Djala, young male. Saved from certain death in the Congo. Irrepressible behaviour, rather a joker. Once, he found a large lump of chalk and threw it at me. Mouila, female. A very stable female, but not a particularly good mother. 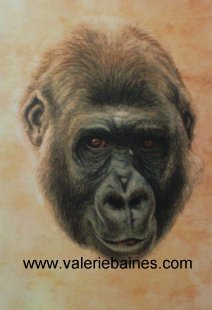 Boulas, young male. First son of Mouila and Bitam. Very assertive character.